Chef/owner Manabu Kikuchi of Sushi Izakaya Gaku offers a trio of his specialties: Omatsuri Natto, left, Teriyaki Chicken with Sansho Pepper and Sliced Tako with Basil and Garlic Dressing. Amidst the sudden flurry of grand restaurant openings and great expectations, one in particular stands out because of its relatively small size, low-key vibe and quiet media reception, but make no mistake, it ranks right up there with the big guys. 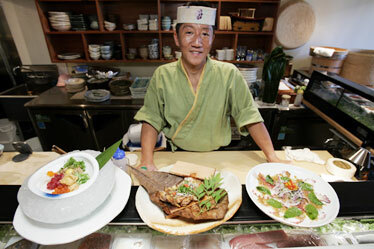 The buzz about Gaku Sushi Izakaya has been spreading person to person for about a month. I have to thank reader Mark for letting me know about it first, but its name has popped up in several conversations since then, always followed by, "It's so good!" In other words, you will need a reservation to dine here, though they seem to discourage this after the 5 to 6 p.m. seatings, not knowing how long customers will stay. The dining room fills up quickly, and upon tasting the food, people invariably can't stop trying new dishes and end up lingering for hours. Regulars at Imanas Tei had the inside track, following head sushi chef Manabu Kikuchi to Gaku Sushi Izakaya as he ventured into chef/owner territory with a place of his own. The name is a mouthful, I know, so rather than tripping over all eight syllables and hav-ing them dig out shreds of paper from their wallets to jot it down, I've just been telling people the address on King Street just before Keeaumoku, where Kikuchi presides over some of the freshest seafood in town. With confidence in the quality and flavor of the fish served, there's no messing here with such novelty sushi as caterpillar, dragon and rainbow rolls. It's a haven for purists, but that doesn't make it snobby or boring. The staff is energetic, lively and generally well informed, and there's an adventurous streak running through the grill and kitchen menu, though never at the expense of flavor or ingredients' integrity. In three visits, I haven't stumbled across any major menu missteps. There's a tendency to take a timid approach to any new restaurant because no one wants to eat their mistakes, but people tend to become emboldened quite quickly here. They might start out reading every single line, trying to avoid weirdness. After a few life-affirming bites, they're bravely ordering this and that, looking over at their neighbors' plates and adding whatever they're having, too. That is how I discovered the grilled scallops ($7) spiced with shichimi togarashi pepper and wrapped in nori. Black hatch marks on the scallops left their bitter trail, but it wouldn't sway me from ordering this again. The only problem with adding to your table as you go is that as the evening wears on, it gets busier, so it can be hard to flag down a waiter; then it's another wait for the kitchen staff to work through all the orders. BE PATIENT and you'll discover new favorite dishes. One of mine was the simple, refreshing, summery "taraba no kyurimaki" su appetizer ($9.50) of king crab wrapped with cucumber, sliced into thin, bite-size rounds and served in light seasoned vinegar with "mozukusu," a soft, silky Okinawan seaweed as slippery as a dish of chicken long rice. It was all the more amazing given the fact that I don't usually enjoy eating cucumbers. Fish lovers might gravitate toward the hamachi kama ($9.50) or grilled moi. Octopus and squid turn up rubbery more often than not at most restaurants. Here, both are masterfully handled so the octopus is tender, served cold and thinly sliced ($9.50), each piece topped with a torn basil leaf and a light garlic dressing, and the squid ($6.50) takes on a nice, crunchy -- not laboriously chewy -- texture when deep-fried in a coating flecked with nori. I've been told it's expensive, but for the quality of food, I don't think it's prohibitive at all. You don't have to order a lot of dishes to feel satisfied, but people tend to get hooked and order more than they should eat in a sitting. Honestly, you don't have to try everything at once. Start over next week or tomorrow. Naturally, seafood dominates in raw, baked or grilled form. If you don't feel like eating fish, you'll find other typical izakaya fare such as garlic rib-eye steak in ponzu sauce ($13), chicken karaage ($6.50) -- a touch of salt would have been nice here, considering the bold flavors that came earlier -- and teriyaki chicken ($6.50). There are also hot and cold udon ($5.50 to $6.50), delicate chawanmushi, or warm egg custard, with chicken ($4.50), and chazuke with ahi or salmon ($7.50). The meal is like dessert in itself, rewarding with every bite. If you do feel the need for something sweet on the way out, there's ice cream ($3), "zenzai," a dessert of mochi balls in cold azuki beans ($3.50) and their own house custard ($3.50).